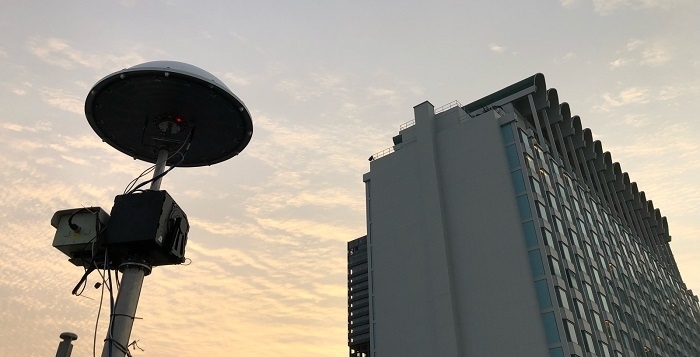 The AARTOS AI based Drone Detection System developed by Aaronia AG was used at the historical meeting between Kim Jong Un and Donald Trump in Singapore. The fully automatic drone detection system AARTOS detects the RF emissions of any drone and its remote control and offers a live situation awareness display including highly featured 3D flight plots. The AARTOS system offers unique ultra-high range (10-15km) 360 degree dome coverage. The detection technology is based on the patented AARONIA ISOLOG 3D Tracking Array Antenna, a UWB real-time RF receiver “SPECTRAN V5” and a highly complex AI based Tracking-Software. The Drone Detection System allows very detailed analysis of any RF emissions e.g. “hopping” patterns of drones but also any other RF signals e.g. cell phones enabling to detect even the latest 4G based drones. The rapid proliferation of micro/mini UAV is a growing potential threat to national and commercial security. As the use of drones becomes more and more common, safety and reliability are of enormous importance. Drone Detection Systems are gaining in importance because of the increasing number of illegal drone entering areas (e.g. major events, airports). For safety, the position of the drones needs to be tracked by their RF emission. The user of the drone will also be detected by the emission of the remote control. Aaronia expects the sales figures of these systems to grow rapidly over the next few years.